I would like to receive occasional information and updates from A Lad in Pannal and jumblebee. 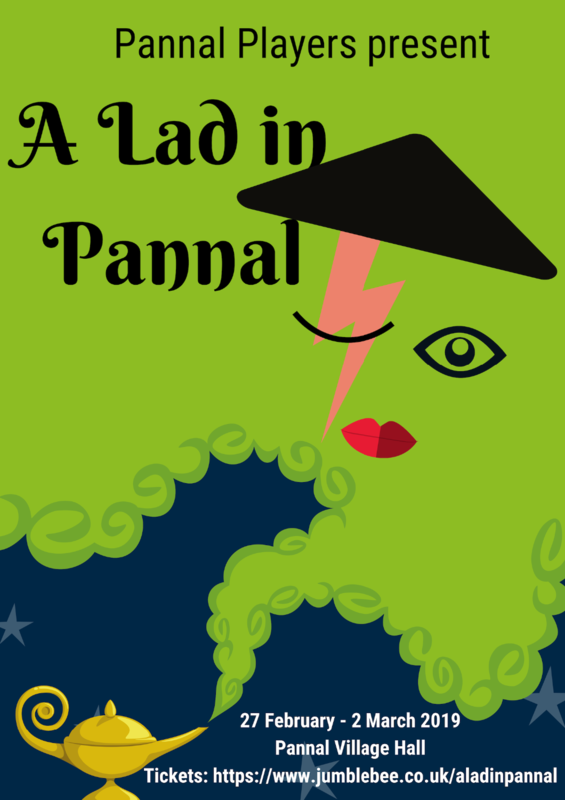 Get on board the magic carpet ride with Pannal Players this February half-term for their riotous pantomime ‘A Lad in Pannal’. Will cheeky chappie Aladdin come good and get to marry his Princess Joanne or will the evil Shazabanaza set him under her spell to steal the magic lamp? Packed with glam-rock numbers, this vibrant production is sure to banish those winter blues. Join them for toe-tapping performances each evening at 7.30 pm from Wednesday 27th February to Saturday 2nd March or for their Saturday matinee at 2.30 pm at Pannal Village Hall, Harrogate. Tickets are £7 for adults and £3 for primary school age children and are available online at https:/www.jumblebee.co.uk/aladinpannal or from Pannal post office.